King Sulayman Alaihissalaam was the king of what would now be recognized as ancient Bani Israa’eel and is recognized as a prophet and divinely-appointed monarch. Muslim belief holds that Sulayman Alaihissalaam was one of the elect of Allah, and was bestowed upon with many God-given gifts, including the ability to speak to animals and control jinn. Muslims further maintain that Solomon remained faithful to a one and only God throughout his life; constructed the Temple of Sulayman (The first Temple), which became one of the key houses of worship for Jews; reigned justly over the whole of Israel; was blessed with a level of kingship which was given to none after him; and fulfilled all of his commandments, being promised nearness to Allah in Heaven at the end of his life. Nabi Sulayman Alaihissalaam remains one of the most commemorated and popular holy figures in Islam. Muslim tradition further maintains that, along with Nabi Dawood Alaihissalaam and Dhul-Qarnayn, Sulayman Alayhissalaam was one of three great monarchs of all time. Sulayman Alaihissalaam’s Temple, also known as the First Temple, was the Holy Temple ( Beit al-Quds) in ancient Jerusalem, on the Temple Mount (also known as Mount Zion).It is the highest point in the city and also is said to be the place were hundreds of Prophet’s prayed and preached, this place is considered blessed and Holy by all three Ibrahimic Religions namely, Judaism, Christianity and also it is holy to the Islam because Our Prophet Mohammad ( Sallallaahu Alaihi Wasallam ascended from there in the night of isra wal Meraaj. According to Historical Sources, ‘The Ark of the Covenant’ is thought to have been manufactured on the slopes of Mount Sinai after the Bani Israa’il left Egypt, and contains stone slabs from the Prophet Musa (Alaihissalaam) and other items from the Prophet Harun (Alaihissalaam). Later on, the belief began to spread that the Ark, which was not seen for the next 500 years by anyone, had not been destroyed but had been buried in a secret location under the Temple by the Levites responsible for its safekeeping. 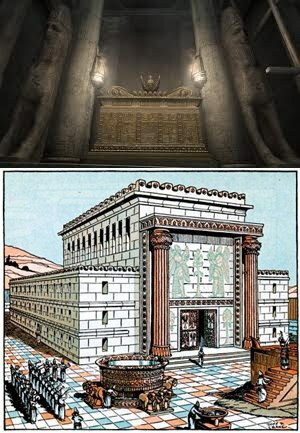 After the destruction of the Temple by the Roman Governor Titus in 70 AD, it was assumed that the secret chamber had been found and that the Ark and the other holy artifacts from the Temple had been carried to Rome. The Ark has remained lost since 587 BC up to the present day. No sign of the Ark was found then or more recently, and the subject has become a focus of interest for researchers in modern times. According to all related hadiths, the fire of Zionism spurred on by some Jews will come to an end at the time of Imam Mahdi, and Islamic tolerance and Qur’anic moral values will spread among them. To Al-Masjid Al-Aqsa, means the Sacred House which is in Jerusalem, the origin of the Prophets from the time of Ibrahim Al-Khalil (Alaihissalaam). The Prophets all gathered there, and Prophet Sallallaahu Alaihi Wasallam led them in prayer in their own homeland during Isra Wal Meraaj. This indicates that he (Sallallaahu Alaihi Wasallam) is the greatest leader of all, may the peace and blessings of Allah be upon him and upon them. “I was brought al – Buraq, an animal white and long, larger than a donkey but smaller than a mule, whose stride was a distance equal to the range of its vision. He dedicated it to the worship of Allah, the One True God. Like his father, Prophet Dawood (Alaihissalaam) , he was a Prophet and a Messenger, calling all humanity to the worship of Allah and to establish piety on the earth. 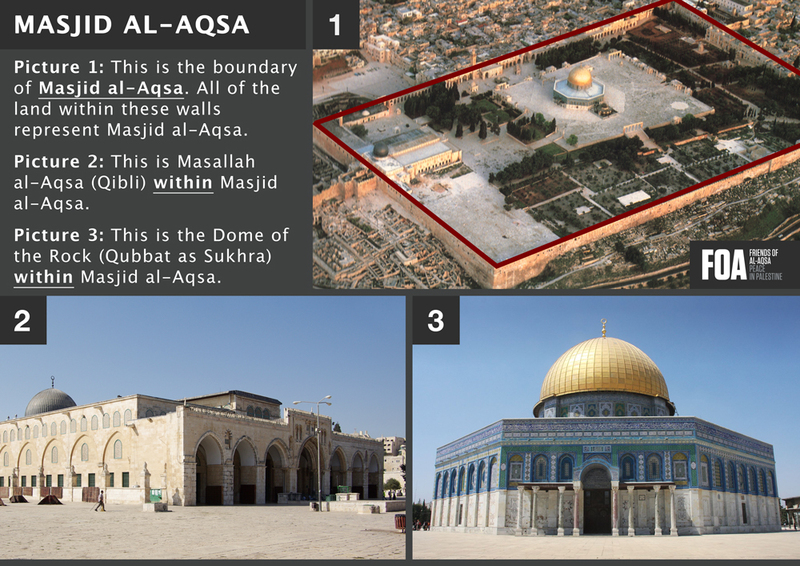 Now, all these years later and its nowadays, there is some confusion about the site of the real Al-Aqsa mosque. In the eastern part of Jerusalem is the Old city, a quadrangular area built on two hills. Within the wall there are four quarters. The Muslim quarter, on the east, contains the Haram al-Sharif, within which are the ‘Dome of the Rock’ and the ‘Mosque of al Aqsa’. Both places are sacred sites for Muslims. However it is around the Mosque of Al Aqsa that the confusion lies. Whenever mention is made in the local or international media pertaining to Al Aqsa, a picture of the ‘Dome of the rock’ will appear. These two mosques lie within a rather close proximity to each other but they bear little resemblance. All over the world, we can find pictures of the ‘Dome of the rock’ under the heading ‘Al Aqsa’ , to the point that people aren’t really sure anymore, which is which. The Dome of the Rock, huge timber mosque which held three thousand worshipers was erected on this site, the site of the present Al-Aqsa Mosque. Fifty years later, near the end of the 7th century, it was given to the Umayyad Khalif, ‘Abdul Malik ibn Marwan, to construct one of the world’s most beautiful and enduring shrines over the rock itself. Highlighting the skyline of Jerusalem, and the memories of all that visit, the dome of the rock is a tribute to the Muslims’ love and respect for this site. Actually Al Aqsa Mosque was the original qibla (The direction ofMuslim prayers), which was later changed during the time of Prophet Mohammed (peace be upon him) to the Ka’ba at Mecca al Mukarramah. The reason for the deliberate dispersion of false information is also clear and simple. By focusing attention on the ‘Dome of the rock’ under the label of Al-Aqsa, all the Muslim people all over the world will not know when the real Al-Aqsa mosque finally disappears !! In the image right side picture is the real image of our previous qibla. When the Messenger of Allah was sent and Allah reminded the Jews of the covenant that they had with Him, especially concerning Muhammad (Sallallaahu Alaihi Wasallam) , some party among them throw it aside.When Muhammad (Sallallaahu Alaihu Wasallam)came to them, they wanted to contradict and dispute with him using the Torah. However, the Torah and the Qur’an affirmed each other. So the Jews gave up on using the Torah, and took to the Book of the magic of Harut and Marut, which indeed did not conform to the Qur’an. “During the time of Prophet Solomon.’ Beforehand, the devils used to ascend to heaven and eavesdrop on the conversations of the angels about what will occur on the earth regarding death, other incidents or unseen matters. They would convey this news to the soothsayers, and the soothsayers would in turn convey the news to the people. The people would believe what the soothsayers told them as being true. When the soothsayers trusted the devils, the devils started to lie to them and added other words to the true news that they heard, to the extent of adding seventy false words to each true word. The people recorded these words in some books. Soon after, the Children of Israel said that the Jinns know matters of the Unseen. When Sulayman Alaihissalaam was sent as a Prophet,Sulayman Alaihissalaam was tasked with spreading Allahs word ie: the belief and worship in ONE god. It came to Sulayman Alaihissalaam’s attention that groups of people in the land were still practicing magic and the occult. He ordered his guards to go throughout the land and confiscate every book, manuscript, tablet, or page that any occult or instruction to do magic or witchcraft was written on, as these taught people the practice of summoning spirits (Jinn). When Sulayman Alaihissalaam and the scholars who knew the truth about Sulayman Alaihissalaam perished, there came another generation. To them, the devil materialized in the shape of a human and said to some of the Bani Israa’il, `Should I lead you to a treasure that you will never be able to use up’ They said. `Yes.’ He said, `Dig under this throne,’ and he went with them and showed them Solomon’s throne. They said to him, `Come closer.’ He said, `No. I will wait for you here, and if you do not find the treasure then kill me. ‘ They dug and found the buried books, and Satan said to them, `Solomon only controlled the humans, devils and birds with this magic.’ Thereafter, the news that Solomon was a sorcerer spread among the people, and the Children of Israel adopted these books and started to practice and spread black magic through out the world. As a result , people of straight path again lost their true path. Whenever masjid Al-Aqsa is spoken about in the media,they always show the image of only the dome of the rock,why?? So that most people remain unaware which building truely is Al-Aqsa. This is a zionist ploy, so that when the real Al-Aqsa will be destroyed,most people won’t even realise it is happened. Muslims should take it as a duty to know which is the real Al-Aqsa mosque. We know that Masjid Al-Aqsa has been under siege for many years. Palestinian people have not known peace since the State of Israel was formed in 1948. Everyone believed it was because they’re Muslim, and because Israel wants their land, particularly the land on which Al-Aqsa is built. In order to find out the truth, we had to go way back in history and literally put the confusing pieces of the puzzle together. • There are Jews that believe in one god – praying properly etc. • Then there are Jews that are “ashkenazi” and those that believe in the origins of the Jewish religion. Prior to Judaism, the people of that land were Zionist. They believed in Zionism, which has its roots in a practice called “Kabala” (this is an ancient form of Jewish magic and is based on the principles of the occult and paganism ie: believing in gods and goddesses as well as satan). This practice was learnt from the ancient Egyptians prior and during the time of Moses (Musa AS). Further research proves that what they actually worshipped was Jinn. • The Qur’an warned us to never take Jews as our friends. Allah warned us that they would work to destroy Islam. And this is something we see happening. • Muslims are awaiting the second coming of Isa Alaihissalaam The Messiah. 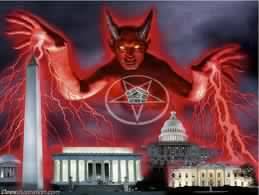 We also know that the Dajjal (the Anti-Christ / False Messiah) will appear before Isa Alaihissalaam (Jesus) does. Jews also believe in a “second coming.” They are preparing for it. However, the interesting thing is that the Jewish faith does not recognise Isa Alaihissalaam. Jews do not acknowledge Isa Alaihissalaam at all. If they do not acknowledge Isa Alaihissalaam and don’t believe he’s returning, yet they are awaiting a second coming…then who are they waiting for?? The false messiah Dajjal. • Sulayman was tasked with spreading Allahs word ie: the belief and worship in ONE god. • It came to Sulayman Alaihisalaam’s attention that groups of people in the land were still practicing magic and the occult. He ordered his guards to go throughout the land and confiscate every book, manuscript, tablet, or page that any occult or instruction to do magic or witchcraft was written on, as these TAUGHT people the practice of summoning spirits (Jinn). • So, on Prophet Sulayman Alaihissalaam’s instruction, they brought all books to him, and he then buried them where he thought they would be safest i.e. : no one could get / steal them. • Where did he bury them?? In the foundations of the temple, under his throne! He appointed guards known as the Knights of the Temple of Solomon (Knights Templars) to guard the temple day and night. • The Knights did this initially. When Sulayman (Alaihissalaam) passed away (May Allah grant him Jannah), The Knights discovered what it is they were guarding. They quickly realised the significance of this information, the practices and magic that they had at their fingertips. They stole it and began practicing. They moved completely away from religion and God, and immersed themselves under the power and influence of Iblees (Shaytaan). Due to the nature of their rituals, they quickly became the most powerful and wealthiest people in the land. (Recent interviews with members of the occult confirms that Satan rewards his followers with masses of wealth and material gain in this world, provided they do whatever he wants them to ie: spreading corruption, ungodliness and destruction on earth. Interviewees also said that Satan assures them, via his high priests and priestesses, that he is the real God – And that he is just misunderstood!). .• Subsequently over the ages, the manuscripts were smuggled into Europe, and the Knights Templars took on the name “Free Masons” – With this new found power, they quickly spread this knowledge across the world, in the forms of secret societies – ALL WITH A COMMON GOAL: To serve their “god” Satan, and to prepare for the arrival of the one-eyed Dajjal, who is Satans representative on earth. Their symbol is a pyramid topped by an “all-seeing” ONE eye! 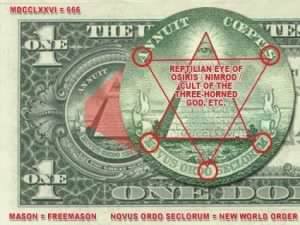 THE BEING WITH THE ONE SEEING EYE IS WHAT THEY WORSHIP. AND ISLAM WARNS US AGAINST THE BEING WITH THE “ONE” EYE. So if the masons have got this “secret treasure” already – WHY all the focus on destroying Masjid Al-Aqsa? Well, simply put, they are preparing for the arrival of their deity “DAJJAL”. “Well, in Islam we know the Dajjal is the false messiah. Meaning – he will imitate the true messiah in every way. The true Messiah, Hadrat Isa Maseeh (Alaihissalaam) will come back to rule the world from JERUSALEM. The Zionists refer to the land between the Nile and the Euphrates as “their promised land.” Dajjal is their king, AND ONE CAN SEE WHAT’S HAPPENING IN THESE AREAS CURRENTLY BETWEEN THESE TWO RIVERS, Egypt is been replaced by a tyrant Sisi who is a Jew, Iraq is been desteoyed by ISIS whose chief is a mossad spy, Syria is being targeted by the kuffaars who are the real terrorists in suits and boots sitting in the UN etc, and in keeping with their occult belief, they have to resurrect the original temple for him to take his throne. 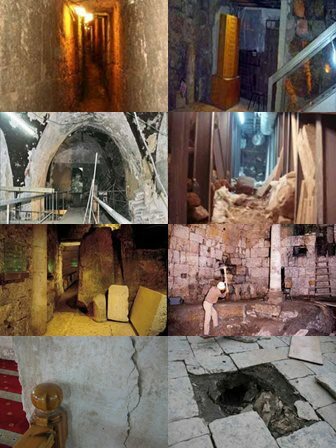 Archeological and historical evidence proves the ruins of the original temple of Zion is underneath the temple of Solomon. Meaning Hadrat Sulayman (Alaihissalaam) knew how evil this magic is, that he built his MOSQUE OVER THE ZIONIST SATANIC TEMPLE. Simply because people praying in that Mosque, worshiping one true God is strong enough to override any evil that happened there. THIS IS WHY THE JEWS/ZIONIST WANT TO DESTROY MASJID AL-AQSA! THEY NEED TO RESURRECT THE TEMPLE BENEATH. It’s common sense, logic! The Dajjal is inherently evil – so he will not be able to enter any holy place. Meaning he cannot rule or enter Al-Aqsa Mosque, where the worship of one true God takes place.The only place he can enter and rule from, is a temple in-keeping with his evil nature. • This also explains why the US Govt is so buddy-buddy with Israel. They have a common goal, and common belief. They work for a force far greater, and far more evil and deceptive than you and I could ever comprehend. This is why their foreign policy is pro-Israel. This is why they allow Palestine, Syria, Iraq to be attacked over and over again. They need to destroy Al-Aqsa. And this is why they portray Muslims to all be terrorists. They want to turn the world against us in hatred, because the fact is, the people who will continue to defend Masjid Al-Aqsa are Arabs! MUSLIMS! Muslims understand the significance of Masjid Al-Aqsa, it is Islam’s first Qibla. Therefore the Muslim people of that land is their greatest resistance. And these disciples of Dajjal know that. Everything falling into place.Allah protect us and keep us steadfast.Makes sense in this senseless world where human life means nothing.so on par .. Fact: Musjid al Aqsa is Islam’s first Qibla, second musjid ever built and third haram.